Home > News > Join our AmeriCorps Ohio College Guides Team for the upcoming 2018-19 School Year! 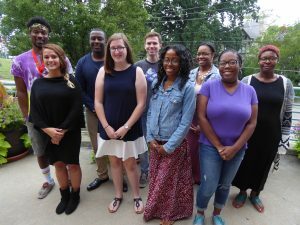 Join our AmeriCorps Ohio College Guides Team for the upcoming 2018-19 School Year! Make a real impact on the lives of Cincinnati students and their surrounding community – become an AmeriCorps Ohio College Guide! Serve as an advisor, mentor and guide for underserved youth in Ohio, specifically- first generation college-going, low-income students in Cincinnati Public Schools. College Guides help students acquire information and knowledge necessary to prepare for, access and complete a postsecondary credential. facilitate successful postsecondary transitions, persistence and ongoing financial education with high school graduates. Develop advising, mentoring, interpersonal, and leadership skills. Ohio College Guide positions are a full-time commitment of 1,700 service hours to be completed in 11 months, starting in August 2018. College Guides will receive a modest living allowance ($13,732.00), health insurance, and the Segal Education Award of $5,815 upon completion of service. Existing qualified student loans are deferred during time of service and a portion of accrued interest may be eligible for payment by the Corporation of National and Community Service. AmeriCorps Ohio College Guides receive ongoing skills training, and professional development opportunities. The host sites for the 2018-2019 Ohio College Guides program are: Canton (Stark Education Partnership); Cleveland (College Now Greater Cleveland & Esperanza Inc.); Cincinnati (Cincinnati Youth Collaborative); Columbus (I Know I Can); Marietta (Connect to Success), Oberlin, (Ninde Scholars Program), Warren (Mahoning Valley CAP); Yellow Springs (Greene County College Success Partnership), and Zanesville (Scholarship Central).